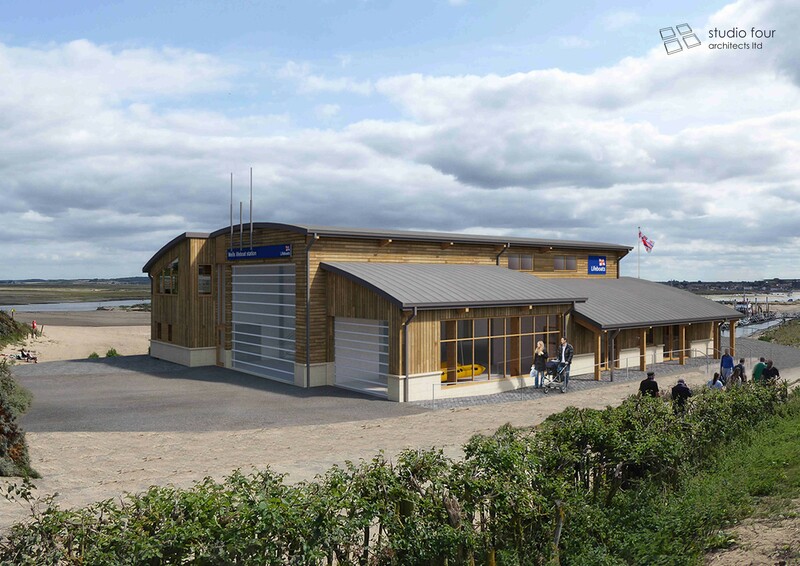 We have recently submitted a Planning Application on behalf of the RNLI to North Norfolk District Council for a new building to replace the existing Wells-next-the-Sea lifeboat station. Studio Four submitted Planning to NNDC whilst environmental consultants Royal Haskoning DHV simultaneously lodged a Marine License Application with the Marine Management Organisation. The site is located in the Norfolk Coast Area of Outstanding Natural Beauty (AONB), North Norfolk Coast (National) Landscape Character Area and on the North Norfolk Heritage Coast. It is also within The Wash and North Norfolk Coast Special Area of Conservation (SAC), North Norfolk Coast SAC, Greater Wash Potential Special Protection Area (pSPA) and North Norfolk Coast Special Protection Area (SPA) and Ramsar. A comprehensive Environmental Impact Assessment was therefore required, in addition to a Flood Risk Assessment and a Landscape and Visual Impact Assessment. All the reports were included in the Environmental Statement which accompanied the applications. The proposed station provides modern crew facilities including a larger Crew/ Operational Room, Training Room, Changing Room and Workshop. 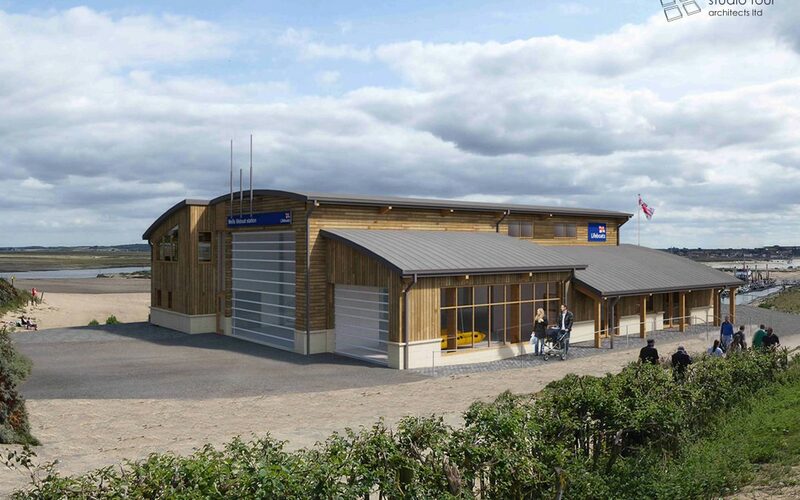 The new station will also house a Visitor Engagement area and Souvenir Outlet allowing the RNLI to convey the sea safety message to the many visitors in this extremely busy tourist location. The contemporary two-storey building is to be located adjacent to the footpath to the main beaches at Wells. With features in line with current RNLI operational standards and high energy efficiency including a ground-source heat-pump, it will be timber-clad with curved barrel stepping roofs and large windows enabling the RNLI crew to survey the miles of sandy beaches, the harbour channel and the extensive salt marshes beyond. It will be replacing the existing Wells lifeboat station which was badly flooded in December 2013 as can be seen here in a video shot from the bow of the Mersey-class lifeboat which was in the Boathouse at the time.